There's always a case when you'll have to replace some type of plumbing pipes in your home. Assuming there is no emergency at hand, you should think about some of the best times to make these changes. Replace the pipes that are exposed. Homes with plaster walls, wood paneling and other similar features may make it difficult to access the pipes. Consider replacing the pipes that aren't buried in the walls. Replacing pipes in a crawlspace or a utility room is typically a straightforward job for a plumber and could be beneficial to your plumbing setup overall. Replace pipes when you are renovating! When you're in the process of remodeling your home, you should take some time to have your plumbing inspected. 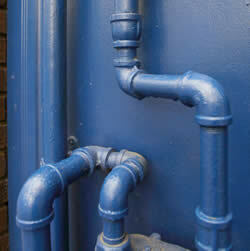 At this time, when the hard to reach pipes are exposed, call in GreenTeam Plumbing for a check-up! Because you've already exposed the area and will have to have an inspection anyway, save some money and have this process taken care of while your walls are already knocked down!